NEWS ALERT: Due to a printing error, delivery of the April 11 edition of the Hutchinson Herald will be delayed this week. It will be mailed out as soon as possible, though with weather conditions there may be an additional delay. Menno city and rural residents can pick up their issues at Total Stop on Highway 18 in Menno. All other subscribers will receive their copies in the mail later this week. This online edition of the Hutchinson Herald supplements the weekly print edition of the Herald, providing additional photos, features and online links to community resources. The print edition, published every Thursday, is available by subscription and single-copy sales at the Second Century Publishing office at 308 S. Main Street in Freeman. Single copies are also available at the Total Stop Food Store on Highway 18 in Menno and at Heritage Health Center on Fifth Street in Menno. For more on subscriptions to the Hutchinson Herald, see the subscription option in the menu below. 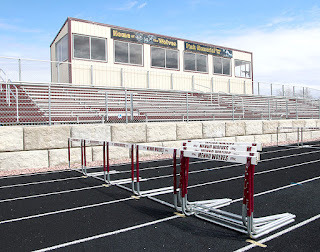 The grandstand and pressbox at the Menno High School track and field complex were ready for action Tuesday, April 9, but the weather forecast forced school officials to postpone the Menno Relays, scheduled for Thursday, April 11, to Monday, May 6. Snow and blizzard conditions were expected Wednesday and Thursday, April 10 and 11.